It’s here – 2016 has arrived and with it, the future of eCommerce! No longer do you hope and pray that your products will be available in online stores only to wait two weeks for them to arrive on your doorstep. Now, next-day shipping is the norm if you are within a certain geographical radius, and delivery has become even quicker with services like Amazon Prime Now, Favor, and Google Express, which bring you products within the hour. Not only have delivery times speeded up exponentially, but now you are probably shocked if you encounter an eCommerce business that does not allow for free returns. Paying for returning an item should remain a painful memory of a bygone era. In 2016, shopping online is big business, and people love to do it. Now, with the New Year in full swing, it is time to ask yourself, “What is the future for eCommerce? What is the next innovative leap that it will take, and how will this affect my business?” The answer may very well be drone delivery. In 2013, Amazon launched the Amazon Prime Air concept, where it promised same day delivery to customers through the use of drones. Google X shortly followed suit by announcing plans for its Project Wing. Even Germany’s DHL got on board and announced that they, too, would be working to use drones in their deliveries. 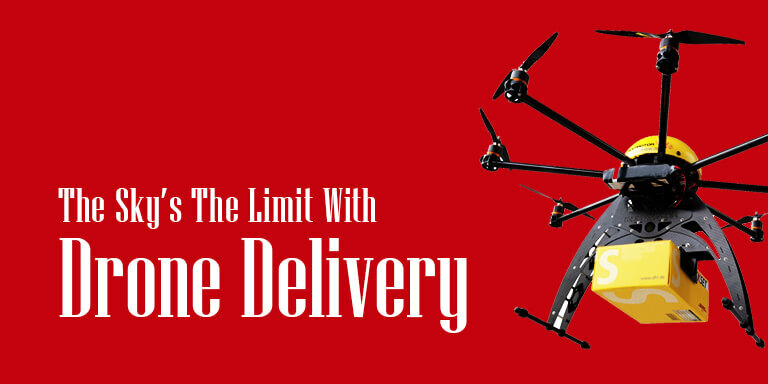 Until very recently, however, using drones for delivery services in the United States was at a standstill. Companies were champing at the bit to be authorized to use this technology freely in American skies, but the Federal Aviation Administration (FAA) was not ready to grant permission. It has not been an easy road for drone development. No government or civil aviation authority wants to grant permission for mini aircrafts to zip all over busy cities. When commercial drone usage originally came up for debate, opponents required that users operate them in an orderly, regulated fashion, and that they address the safety and privacy issues associated with being in close quarters with tightly packed populations. Due to these concerns, in June 2014, the FAA released a statement saying that drones can only be used for hobby and recreational purposes, and must always remain within eyesight of the operator. Currently, this still holds true. However, regulations are slated to change later in 2016. FAA Deputy Administrator Michael Whitaker said that the new drone regulation will be finalized by June 2016. These new rules will be used to allow widespread unmanned aerial delivery services by companies. The current drone proposal that was offered in February 2015 requires drones to fly during daylight hours and to remain within an operator’s line of vision. As this would drastically limit the versatility of drone delivery, the FAA is in discussions with industry stakeholders about altering the final regulations to accommodate more autonomous drones that would be capable of flying unmanned over longer distances. In addition to crafting the written doctrine for these aircrafts, the FAA and NASA are designing low-level air-traffic system regulations to guide drones and avoid mid-air collisions and traffic. Google and Amazon are also simultaneously working on their own air-traffic systems. With all this new technology in the works, imagine how your own eCommerce business could take off. In the beginning, it will be paramount that your business place an emphasis on after-sales support, as well as implement a great return policy. Without a responsive customer service team, it will be hard to field the mishaps that will occur due to new technology use. In fact, next to investing wisely in new technologies, customer support may be the best investment that you could make for your business. If you choose to invest in drone deliveries when they become available, make sure that you are simultaneously developing close relationships with your customers. Any time that you introduce a change to your current business model, you need to keep your ear to the ground to see how your customer base reacts. This is not a new trend, but it will only continue to gain importance in the world of eCommerce. Without having two-way communication with your customers, you won’t be able to successfully introduce new services into your model. To ensure that you have the right approach, ask for a little extra help from those with eCommerce experience. They will point your business in the right direction and make sure that your eCommerce business is ready to take on the technology advancements that 2016 is going to offer the world.